we make their world, develop the code they see, we create their connection with others, we decide... what happens. But what if... they found a way outside their normal boundaries? 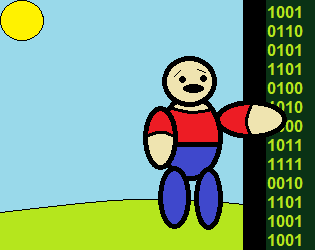 outside the wall of code, away from the rules of the binary code. outside the world we created. ask yourself this... what would happen then? will they explore the insides of our universe completely different from theirs? will they see a new point of view from what their used to? or maybe... they'd turn against us. in this game jam it's up to you to fill in the question: what if our characters escaped their created world? will a new story unfold? will the creator be the unlikely hero of this tale? how does their world get affected without their presence? it's all about the meta of coded heroes (or villians) exploring an area they were never meant to explore. would it be awesome? would it be terrifying? do you still have control over them? outside of their walls, there's no rules. In our world, they can do what they want. and most importantly... can we bring them back? let the mind flow wide in this game jam. it's not about being the best but just trying to come up with senario's that would make a for a meta game within a game. voting ends on 2019-05-10 12PM CET.